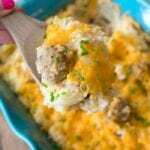 This hamburger hashbrown casserole with sour cream recipe is the perfect brunch or Christmas morning breakfast idea! Hearty meal we love year round. Leave meatballs and hashbrowns on the counter for 1-2 hrs. or until they are mostly defrosted (or use microwave at half power for 1 minute at a time, stirring in between until they are mostly defrosted). Empty hashbrowns and all other ingredients except 1 c. of your cheddar cheese, chives, and your meatballs. Stir well. Fold in meatballs (can cut them into fourths or leave them whole...or use leftover ham instead). Dump mixture into a baking dish and put it into the oven at 350 degrees for about 40 minutes or until bubbly and warm. Sprinkle the last cup of shredded cheese on the top and put back into the oven for 10 minutes or until bubbly and cheese is melted. Sprinkle with remaining chives and serve!